At this time, all news is good news. We had a short cold/wet spell, but the forecast is set fair, warm and dry, for the foreseeable future. The greens continue to remain healthy, with a good sward covering for the time of year. I have left the height of cut at 4.5mm throughout the winter. Our Poa/Bent greens have responded well to this decision, helped by the relatively mild Winter. I have just received the results from my soil samples i sent off. I am pleased and encouraged by the results. Please see an overview below. Today, the 24th of January, we have had the first real ground frost. Personally, it is very welcome. It brings many benefits, including disease and pest represent. The other benefit is, a hard ground frost relieves surface compaction. Wet or damp soil expands when frozen and when thawed, the Fischer’s & air spaces remain, allowing the grass plant roots to breath and flourish. With only 12mm of rain so far this month, compared to the monthly average for January of 96mm, i am hoping for a short winter. Although, nature does have a way of catching up with its self. With less than two weeks until Christmas, all leaves are now off the trees and are being removed from the ditches. 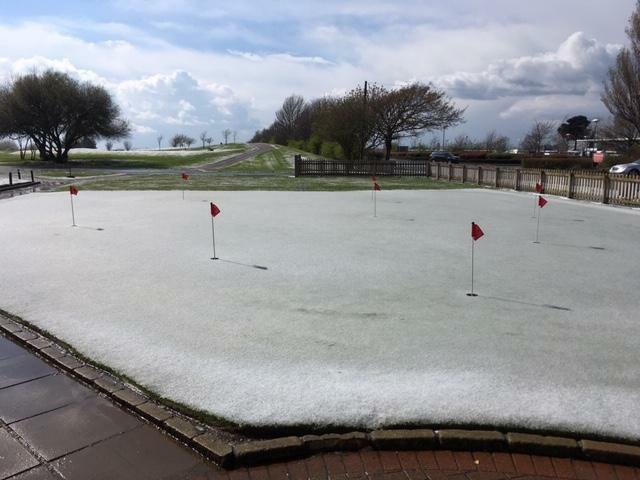 I remain pleased with the condition of the greens at this late stage in the season. 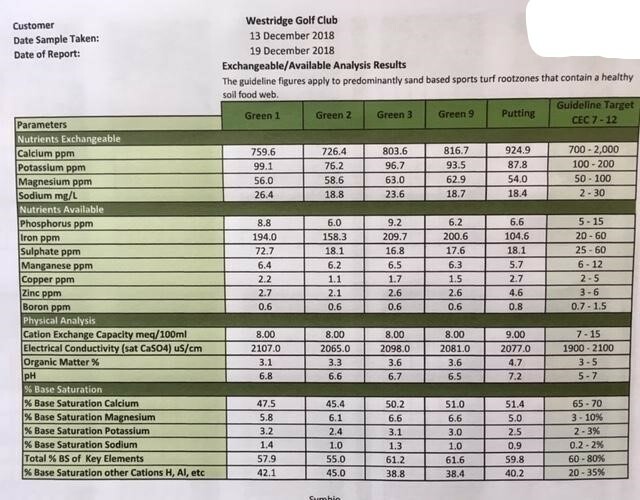 We have taken soil samples from the greens this week and have sent them away for analysis. It is important to know and understand what is going on below the surface, as well as above. Any nutrient deficiency can then be addressed by adjusting my feed programme. Interestingly, the max/min temperature yesterday, was exactly the same as this time last year, only the ground temperature is 2c warmer this year. Finally, could I please again request that all golfers, refrain from taking trolley’s across greens, tee’s, surrounds and aprons. In my blog this week I will be going through with you two ways in that you can tackle windy conditions this winter and stay in control of your ball flight. Many times I have seen golfers play great when the wind is helping or of the left/right, however, as soon as they have a headwind they struggle as the ball rises higher than usual and then drops out of the sky. If you want to know two simple ways that you can tackle the wind and keep control of your ball flight, then keep reading. The first simple way is to move the golf ball back in your stance. However, when you’re doing this, you must remember to aim a little to the left. This is because you are hitting the golf ball slightly earlier in your golf swing and the clubface is aiming slightly more to the right, so you have to aim left to allow for the change in set-up. The second way is slightly harder and requires you to be able to a bit flexible and rotate your body more. My second choice option would be to keep your ball position and stance and swing the same, just shift your body weight to your left hand side, so that 75% of your weight is on your left leg (for a right handed golfer). Then as you swing back, maintain that bodyweight on your left hand side, swing and rotate through the golf ball. If this has helped you in any way then great, if, however, you are still struggling to understand this or would like to know more then please feel free to contact me on 01983 613131 where we can discuss this further and get you booked in for a golf lesson.